Who doesn’t like sunsets? Of all the sites you’ve seen about sunset you feel that there isn’t one that does it right. 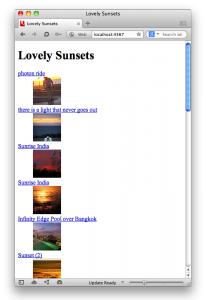 You decide to make the best damn sunset site on the web. There are a bunch of sunset photos. Could we use public images to populate this new awesome site? We’ll create a site while the lawyers figure out that last question. Are the Kids Still Talking About APIs? One might think “I bet Flickr has some great sunset photos.” Indeed they do. We’ll pick on this group. At the bottom of the page you’ll notice an RSS feed. Could we read that feed and display the images and give credit to the proper people? Let’s use our friends Sinatra for our site and rack/test for testing. We will create a feed_aggregator and a test folder inside of it. While we are at it, create a blank main and test file too. Yeah! We failed the test. It says there is no main file. Go ahead and make make that file. Do you think the test will pass now? Let’s find out. Now let’s go get that feed. Since we are developing by tests, it would be a great idea to have a fixture of the RSS feed. Go ahead and make a directory and blank xml file for them. Excellent. Let’s copy the source of the feed into the feed.xml file. If we test against the live feed, entries could change and make it very frustrating while testing. Who needs that? (Note: The entire XML file can be found in this gist. WOW! Where do we start? Why don’t we look for links so that a person can click on the see the original photo on Flickr. If you look at the XML you see that each picture is in an item section. The link tag will take us to the photo’s page. Based on that, we need to look into the feed, find the items, and find the link in that item. That sounds like an awesome test. Write it up. Where did I get the text for the link variable? I copied the link from the first item in the fixture. You will soon see how it is used. Like I stated before, we will load and parse the fixture. The code will look in the first item to find the link node, take its text, compare it to our link variable. It should match. Let’s run the test. I hope it fails. Finished tests in 0.025705s, 77.8059 tests/s, 77.8059 assertions/s. Go ahead and create that method in the main.rb file. Finished tests in 0.251661s, 7.9472 tests/s, 7.9472 assertions/s. Do you think that will get rid of the arguments error? Rerun the test and see. Finished tests in 0.027235s, 73.4349 tests/s, 73.4349 assertions/s. Indeed it did. Now we need a ‘first’ method. In order to get to the first we will need to search through the XML in order to get the first link. Now what’s a way to parse the XML to find that link? I like (Nokogiri)[http://nokogiri.org]. Do you have that gem installed? Let’s check. You’re output might look different than mine. Apparently I don’t. If you don’t, go ahead and install it. Other that seeing in the terminal that it successfully installed, how could you check to see if it’s installed? Where we’re we? Parsing the XML document. You need to load the feed into Nokogiri. Then you can go through each item and get the link and store them in a hash. Don’t forget to return the items. Do you have a good feeling about this? Go ahead and run the test. Did you remember to include nokogiri in main.rb? Snoopy Dance Can we say that? We need to get the thumbnail next. Where is that in the fixture? Did you find it? It’s an attribute in the tag. Go ahead and write a test for that. It’s pretty close to the first one. Finished tests in 0.053503s, 74.7622 tests/s, 93.4527 assertions/s. That was expected. Let’s think this through. We need the value of an attribute of the media:thumbnail node. How about this? That makes sense since the url we need is an attribute of that node. Go ahead and try it. Finished tests in 0.031776s, 94.4109 tests/s, 62.9406 assertions/s. Well, that failed. undefined method ‘attr’ for nil:NilClass It’s not finding the <media:thumbnail> node. If you look at the top of the RSS feed you can see that the media namespace is used. More about namespaces. Turns out, with Nokogiri, you can just uses the pipe symbol to indicate a namespace search. go ahead and swap out the colon and replace it with a pipe in the thumbnail line. Finished tests in 0.045266s, 66.2749 tests/s, 88.3665 assertions/s. Awesome. We should probably use the title of the picture too. Go ahead and write the test for that. I’ll wait. Finished? Here’s what I did. Again, we are using the title from the first item of our fixture. Run test. Finished tests in 0.078211s, 38.3578 tests/s, 51.1437 assertions/s. <"An Evening at Shell Beach">. We need to look for the title. How would you add this to the parse method? Finished tests in 0.062725s, 63.7704 tests/s, 79.7130 assertions/s. Awesome, but let’s see something on a web page. We want results in the browser. To keep things simple I’ll use erb for making the web page. Since we made some changes we should rerun the tests. Finished tests in 0.251257s, 15.9200 tests/s, 19.8999 assertions/s. <"<!DOCTYPE html>n<html>n  <head>n  <meta charset="UTF-8">n  <meta name="viewport" content="user-scalable=yes, width=device-width" />n<title>Lovely Sunsets</title> n</head>n<body>n  <h1>Feed Aggregator</h1>n</body>n</html>n">. Oops. Go ahead and fix that. We are making sure that ‘Feed Aggregator’ is within the page. Now that tests are passing, let’s move on. You re-ran the test right? We’ll add the feed url and then parse out our info. You might notice I am referring to the test fixture instead of RSS feed. Again I don’t want to constantly request from their server while developing. Go ahead and start the server and check out the lovely work in your browser. Everything is looking good. Let’s use real data. How would you wire this up to pull the feed from Flickr? Yep, let’s add open-uri to the main.rb file and then have nokogiri open the file. Sweet. Now you can add error handling, maybe some caching, or multiple feeds. If you would like to see an article on one of these let us know.